As many of you know, February 14th was International Book Giving Day. International Book Giving Day is a day dedicated to getting new, used, and borrowed books in the hands of as many kids as possible. If you took part, today is the day to come and share your news with us. If you are a blogger, please use the Linky tool below to share the post you have written about how you celebrated International Book Giving Day. If you are not a blogger (or haven't had time to write a blog post), please leave a comment on this post letting us know how you celebrated. Once you have left a link or a comment, don't forget to visit some of our fellow participants in International Book Giving Day. From the comfort of your own home, you can travel from Australia to Turkey, from the UK to India, from the Phillippines to the US. I also marked the day by donating to Book Aid International and setting aside some books to give to the daughter of the woman who used to sell the Big Issue from here, although I'm not sure when I'll next see her. We appreciate the poem you wrote for International Book Giving Day! Thank you so much! 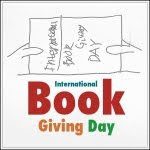 Wasn't able to link up a blog post, but I am so glad I found out about International Book Giving Day this year. I love buying books to give to children for their birthdays, and we did some of that in February. Gave three Elephant & Piggie Books by Mo Willems. Went to a used bookstore last week with my 7-year-old and picked out a few treasures for her and her little sister, too. I'm already thinking of grander plans for next year!